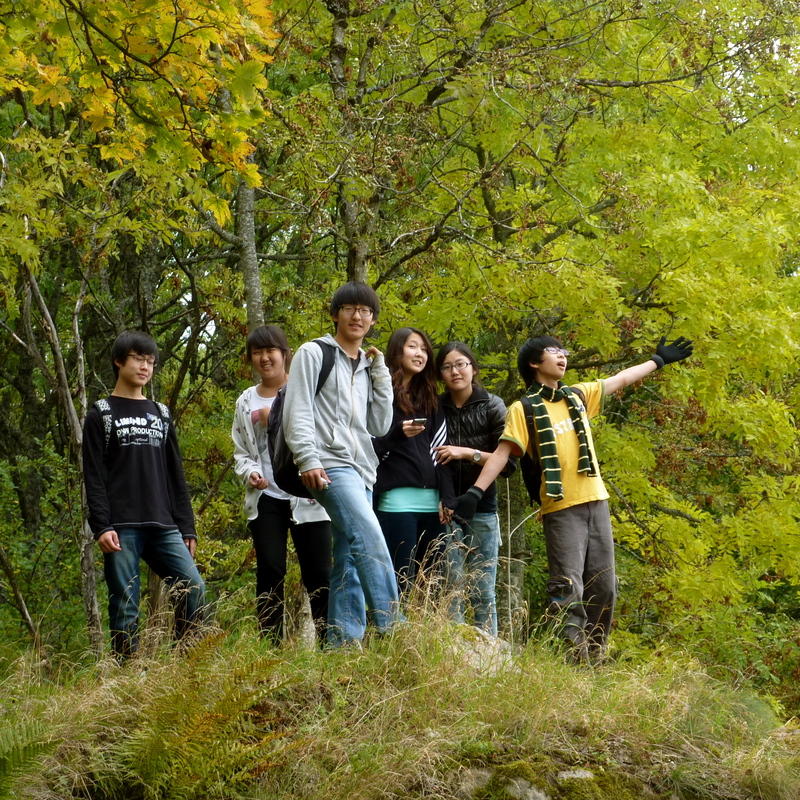 We Are the World: Korean students of an American-run boarding school in Germany, seeing the sights in France. It’s the most universal of the first-conversation questions. After a while you just can’t tell if someone should be in school or not, thus whether it’s appropriate to ask where they attend. That college student might not have a major; that guy you meet at church may have gotten laid off yesterday. And contrary to German language lessons, it’s creepy to ask anyone older than ten how old they are. Since not everyone can be depended upon to have a major, or even a career, we ask for origins. Everyone, after all, is from somewhere. Unless, of course, you’re from everywhere. They’ve asked me several times, affable and self-sacrificing, motioning their sticks down to the other side of the concrete multi-purpose court where we’re playing. “Do you want to play goalie?” No reply. “Then I’m fine here,” I shrug. With a scarf, a warm fleece jacket and two orange cones marking the goal on either side of me, I truly am fine. Better than fine, actually. It can’t be above freezing on this cloudless autumn morning, I’m playing hockey with my Canadian history class. We’ve met the challenge of the second period Geography class, whose Canadian teacher leads students raised in Russia, Korea, the Netherlands and China, among other places. Lone American on my team, I’m the goalie for the Canadians, dodging or being hit by the orange ball when it comes my way. Though it’s only second period, news of this match has gotten around the school already. I overheard it as I came in today. Now the score is 3-3 (owing to my inexperience as a goalie) and I’m loving every moment of this. We have three too many players, so the Canadians generously rotate themselves in and out. A Saskatchewan-born girl declares that she can’t play, because she has a mock job interview next period, but after only ten minutes of cheering from the sideline she accepts the first handed off stick and enters the game. They are all gleeful laughter and mischievous grins as they intercept and pass and steal the show, taking the ball up and up. They are good at this. Geography Teacher and I are heroes for devoting class time to a hockey game, but I know I’m only a spectator today, really, taking up the space between two cones so that the real players can weave their intricate game across the court. The other team really isn’t bad, either, but I’m overwhelmed by the sense of pride and ownership that the Canadians take in this. I try to imagine a group of similar Americans playing baseball somewhere, but the analogy fades in translation. One of the things I’ve loved about teaching this class, I realize, is that together we’re uncovering where they’re from. Or at least one of the places. The Canadians don’t all claim to be from Canada, and maybe they never will. Some of these students have never lived for extended periods in this country whose name is on their passports, whose national history they’re compelled to learn. Yet as I watch them play hockey together, I realize that this is more important than just a morning of playing in the cold. The hockey game is a point for them to gather around, a living piece of their history that they can pick up and examine together. Though we joke about it often, I can’t take them on a field trip to Canada, can’t show them around Victoria, BC, which I know so much better than they do. But we can do this. The children of missionaries may have been born in a place they’ve never lived, may have moved more often than they’ve had birthdays. They don’t know what it is to be “from” somewhere, and answer my go-to question with a sigh of frustration. We talk about it frequently, what it means to be anchored in something more or outside of nationality or address. How home isn’t a specific building and how nations are bigger than their borders. We talk about being at home in God’s will or safe in the communities of family and friends, no matter how temporary. And I like that about BFA, the international, many-rootedness of it, linked together with an intricacy that is itself a testament to the marvelous, creative work of God. I love that our students are from everywhere, and they often claim several countries rather than none when asked to identify their origins. Today, though, I love that my Canadians are playing hockey–some of them for the first time, some for the hundredth–and that I get to experience fromness with them, if only for an hour. 1. I’m with you on the “sojourners” thing, as you probably know. Though I love the rootedness that’s come to our lives by being connected to a particular place, the journeys, friends in far places, and capacity to set up shop out of a backpack and be fully present with people, if just for a week, or year – this is a profound gift and I’m grateful its in the fabric of my life. 2. Your comment about baseball rang true – sort of. I think we boomers, who weren’t rasied by soccer moms, all played little league as kids, all watched the world series on TV, all knew Willie Mays, the way people know Taylor Swift today. Baseball WAS in our national dna, as the “Brothers K” reveals, though its changed. And, as boring as baseball is, the vacuum left in its absence means we’re poorer culturally. “Football as the national pastime?” Please, no! 3. Looking forward to meeting your students – it’s only a matter of weeks now! 2. I actually pondered “The Brothers K” while writing the post. Since literature tends to live in the present for me, it took me a while to remember that it was set in the 60s. As much as I hate to admit it, I think that here at least, football has more cultural currency than baseball. It’s what people follow, and there are even some rogue American football fans in Europe. (The 49ers are playing the Broncos in London tomorrow!) But even if it were a football game, I don’t know if I could see our displaced American kids rallying around en masse like that. Hockey is rooted in geography and climate in a way that we, with our many climates, can’t grasp as much. 3. I am SO excited to see you soon! Counting down the days.